Casa de Campo - 7,000-acre luxury resort in La Romana, Dominican Republic --Offering an unmatched array of experiences found in the Caribbean, including choice accommodations - hotel rooms, suites or spacious villa homes; a variety of dining establishments, including The Beach Club by Le Cirque and La Cana by Il Circo; unequalled sports experiences such as 63-holes of Pete Dye-designed golf; Sport shooting center, polo, tennis, fishing/sailing from a world-class marina and Casa de Campo Yacht Club, exclusive beaches at the resort and at Catalina Island, spa, and Altos de Chavon artists' village, with a wide array of museums, art galleries, boutique shopping, a Wedding chapel, and 5,000-seat outdoor amphitheater, site of international touring concerts. Casa de Campo – a member of Leading Golf Resorts of the World, Leading Hotels of the World. 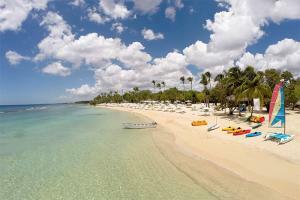 Casa de Campo covers 7,000 acres of land on the southern coast of the Dominican Republic. Pubbelly Sushi - A quaint sushi tavern; The Beach Club by Le Cirque - Fresh, light, and healthy fare; La Cana by Il Circo - Mediterranean fare in the heart of the Caribbean; La Piazzetta - Gourmet, traditionally prepared Italian cuisine; La Casita - Fine Spanish cuisine; SBG - Mediterranean and fusion cuisine;and Lago Restaurant - The flavors of the Dominican. La Romana, Old Santo Domingo, Columbus Lighthouse, El Alcazar Museum.